To achieve a vision of providing healthy protein with less environmental impact, change is needed. 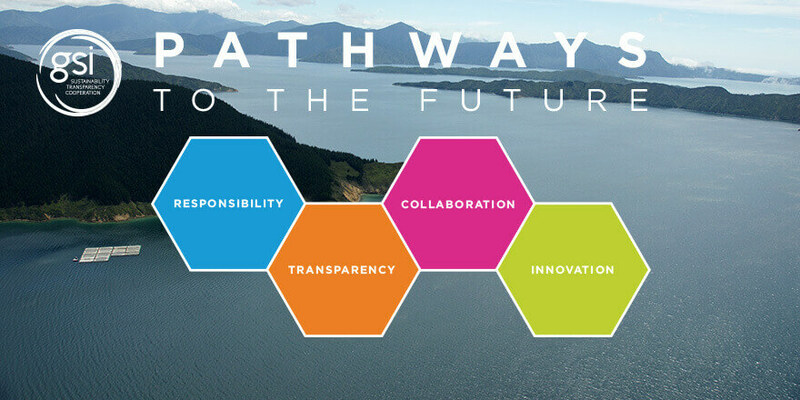 In this blog, the GSI introduces Pathways to the Future and explains why this framework and the four chosen priorities – responsibility, transparency, collaboration, and innovation – are necessary to ensure a sustainable future for salmon aquaculture. As the global population continues to rise, so too does the need for increased food production – especially protein – but the way in which we currently produce and consume protein has significant social and environmental impacts. When we visualize the future of food, we need to ask three key questions – how can we produce enough, is it healthy, and is it sustainable? The World Resources Institute predicts there will be a 70% gap between food supply and demand by 2050. [vi] In simple terms, there is not enough arable land or fresh water to support traditional farming techniques and we cannot continue fishing at the current levels. It is widely acknowledged that satisfying increased demand for food using existing farming practices is likely to lead to greater competition for space, increased greenhouse gas emissions, increased social inequalities, and further deforestation and land degradation. [vii] Although progress is taking place in the sector, agriculture alone is not enough to address the predicted food shortage. Aquaculture, therefore, offers one possible solution to help close the food gap. It is more ecologically efficient and less harmful to the environment than other types of protein production in terms of feed conversion ratio, energy efficiency, water use, contributions to climate change, and pollution. At the same time, responsible aquaculture can support the maintenance of healthy ocean ecosystems by protecting wild fish stocks. However, this potential is not without risk – we know that aquaculture doesn’t yet have all of the answers. Significant change is still necessary if the blue revolution is to avoid the mistakes of the green revolution, and this will need to happen at speed and at scale to have the impact required. 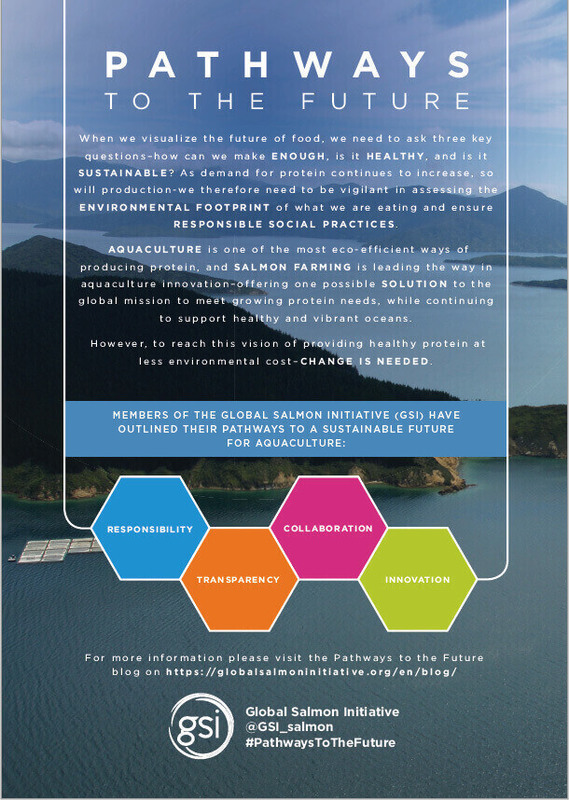 To help realize this vision, we have outlined four pathways that members of the Global Salmon Initiative (GSI) see as key components of an approach to sustainable salmon aquaculture, and our mission to provide enough of a healthy source of protein to meet future demand sustainably. It is possible to close the food gap and to minimize the stress added to the world’s resources, but we must challenge ourselves to act responsibly, promote knowledge exchange to accelerate solutions, collaborate, and innovate. We believe our Pathways for the Future will keep us focused on the current and future challenges we face in aquaculture. We look forward to sharing our Pathways for the Future journey through regular blog posts focused on each of our pathways. You can also follow the conversations on Twitter by following @GSI_salmon, and by using the hashtag #PathwaysToTheFuture.